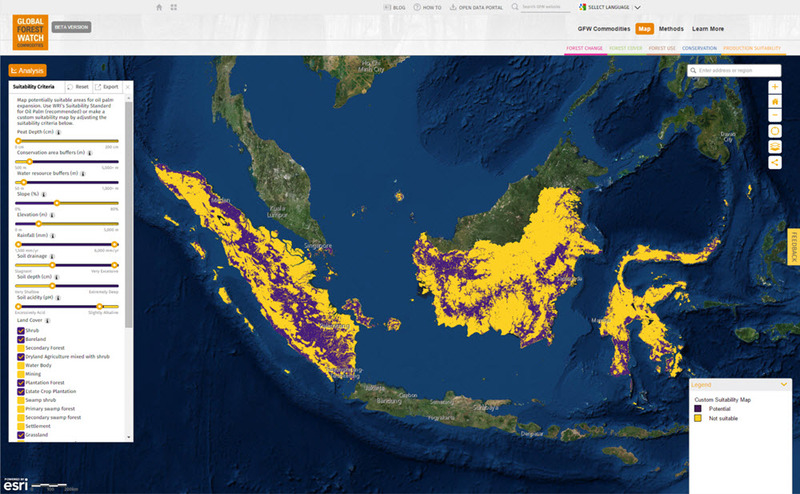 The World Resources Institute (WRI) is launching two powerful online mapping applications that offer unprecedented capabilities to support industry and government efforts to achieve more sustainable palm oil production in Indonesia. The Suitability Mapper helps users find potential sites for sustainable palm oil production, using a customizable map. It empowers companies and government planners to use a standard, easily replicable method to find potential sites for sustainable palm oil production and plan field assessments for further investigation. The Forest Cover Analyzer allows users to view change in forest cover over time in areas of their choice, using up-to-date satellite data. It provides a unique set of monitoring tools to help buyers, investors, and governments strengthen incentives for avoiding deforestation when developing new plantations.